A battling half century from Wayne Madsen - and some useful runs from the tail - has left the match with Surrey still in the balance after Day Three at the Kia Oval. Captain Madsen (59) (above), completed his eighth half century of the campaign in the afternoon session to put his side in a healthy position at tea, before Surrey fought back at the start of the final session claiming four quick wickets. An unbeaten 48-run partnership between Tom Poynton (29*) and David Wainwright (22*), however, made sure the match remained finely poised after the penultimate day as Derbyshire closed on 231-7, a 161-run lead with three wickets still remaining. Despite the early loss of Ben Slater (13), Derbyshire enjoyed a good morning session as Paul Borrington and Madsen added 51 runs to give their side a 10-run lead at lunch. A cautious Borrington batted nicely throughout his watchful 129-ball innings - striking four fours - but the 25-year-old was bowled in the first over after the break for 38. Shivnarine Chanderpaul joined his Captain in the middle, but the Derbyshire batsmen struggled to score freely thanks to some accurate bowling from Tim Linley, Zafar Ansari and Gareth Batty. Chanderpaul only added 14 runs during his 44-ball vigil, before he was trapped lbw by Batty (2-48) to reduce Derbyshire to 120-3, leading by just 40 runs. Madsen, however, remained defiant and - despite taking a nasty blow to the helmet from George Edwards - completed a fine half-century off 137 balls, including five fours. It was only the second fifty of the match and put his side in a good position at tea on 154-3. But some terrific bowling after the restart from Chris Tremlett (2-29) and Ansari (1-50) allowed Surrey to take three wickets for just 13 runs. 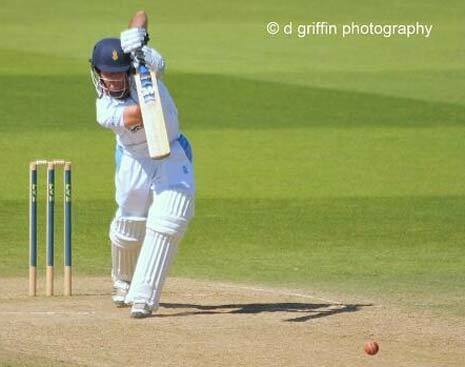 Madsen (59), Richard Johnson (27) and Alex Hughes (1) all fell in quick succession to leave Derbyshire on 167-6. And when Peter Burgoyne (5) was caught at slip off Batty, Derbyshire seemed to be in trouble on 183-7. But an excellent unbeaten eighth-wicket stand between Poynton and Wainwright ensured the match remained in the balance after the third day. Together, they added 48 runs to see out the final hour of play to allow the visitors close on 231-7, a lead of 161 runs.